Already from the middle of the 19th century the Liebfrauenmilch were sold all over the world. The in the beginning mainly from Riesling Wined wine stood for excellent quality until the end of the 19th century and was one of the best and most expensive German wines and also of Europe, which was to be found on the drinks cards of the most important banquets. Prominent lovers were among others the poet Charles Dickens (1812-1870) and members of the British royal court. The wine from the center has one smoky Taste, which comes from the wooden house rubble from the Palatinate War of Succession (1688-1697). At that time, the debris from the city was deposited around the Liebfrauenkirche and built on it vineyards. Then, more and more foreign counterfeits hit the market, especially abroad. At that time, not only with Liebfrauenmilch wine adulteration widespread and then also relatively difficult to detect. The once top quality wine became a cheap, lovely to sweet vinified mass wine the simplest quality, even in large bottles or Bag-in-box cartons was bottled. He became extremely popular in the Anglo-Saxon countries and in Russia, but contributed to the poor image of German wine. In the 1980s, it accounted for 60% of the German export volume, today it is still about one third. The Company Valckenberg today owns most of the historic vineyards around the Liebfrauenkirche. 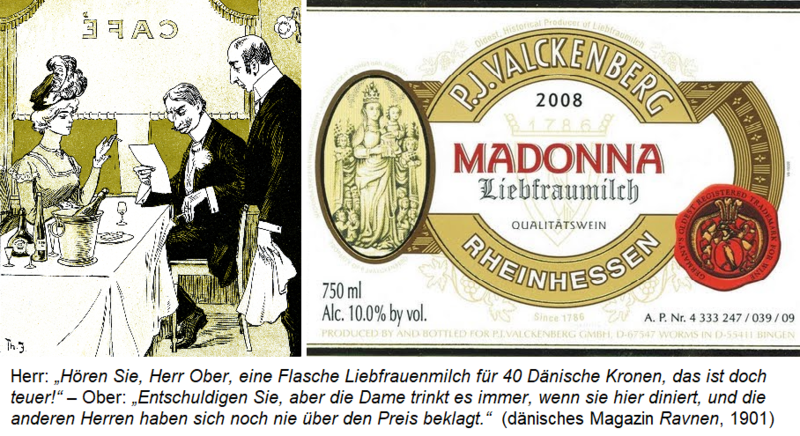 She also has the sole right to the Liebfrauenmilch brand name "Madonna". The rest share the wineries Gutzler Gerhard. Schembs Arno and Spohr, which also market wines under the classic denomination of origin "Wormser Liebfrauenstift-Kirchenstück" (on the bottle label one will not find the name "Liebfrauenmilch" in the latter three wineries). The name "Liebfrauenmilch" or "Liebfraumilch", on the other hand, serves as a regional denomination of origin. The wine is allowed today from grapes of the four growing areas Near and Rheingau, as well as for the most part palatinate and Rheinhessen to be produced. It must be at least 70% of the white wine varieties Riesling. Müller-Thurgau. Sylvaner or Kerner be used freely; in most wines, however, Müller-Thurgau predominates. The Aroma must recognize the typical fruit of one of these varieties, which must not be listed on the bottle label. The Residual sugar content must be at least 18 g / l (sweet or semi-sweet). Other well-known Liebfrauenmilch brands besides "Madonna" are "Blue Nun" (blue nun) of the company sickle in Mainz and earlier "Black Tower" by Reh Kendermann in Bingen, From the mid-1990s, a small group of Rheinhessen winemakers began to crush quality wines, which honor the traditional name "Liebfrauenmilch" again. This page was last modified at 25 April 2018 at 13:05.